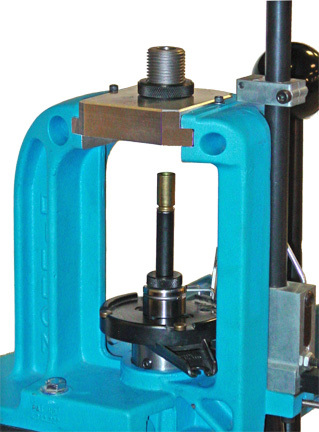 The SOLO™ Single Stage Press Conversion Kit converts your Dillon RL 550b or XL 650 press to a single stage press. This allows you to perform reloading operations that simply cannot be done using a Dillon progressive reloading press. Note: Although both a 550 and a 650 toolhead are shown in the photo at right, only one toolhead is included with each SOLO™ kit. † Not recommended for use with hydraulic case forming dies due to the potential for the case forming fluid (water, oil, alcohol, etc.) getting into places on the press that are difficult to clean. The SOLO™ Single Stage Press Conversion Kit eliminates the need to have a separate single stage press. This saves you both the cost of the press and bench space. Installing the SOLO™ Single Stage Press Conversion Kit is as quick and easy as any caliber conversion. Converting back to normal progressive operation is just as easy. No permanent press modifications are required. The photo at left shows the SOLO™ installed on an RL 550b press with a Redding G-Rx Die installed in the toolhead. Note: G-Rx Die and pushrod are not included with SOLO™ kit. The SOLO™ Single Stage Press Conversion Kit also allows you to utilize the full power of the press linkage as there is no shellplate to flex and the force is directly over the center of the ram. The SOLO™ Toolheads come with UniqueTek's exclusive Toolhead Clamp Kit™ preinstalled. With the toolhead "clamped" into the press frame, your press is just as solid as any traditional single stage press! * Shellholders are not included. ** Toolhead Clamp Kit™ parts are preinstalled. Spare SOLO™ Toolheads - Now Available!